Data warehousing provides decision-support data that is consistent, integrated, standard, and simply understood. Data warehousing is a process for collecting, storing, and delivering decision-support data for some or all of an enterprise. Data warehousing is a broad subject that is described point-by-point in this Refcard. A data warehouse is one of the artifacts created in the data warehousing process. As a total architecture, data warehousing involves people, processes, and technologies to achieve the goal of providing decision-support data that is consistent, integrated, standardized, and easy to understand. A data warehouse is a database whose data includes a copy of operational data. This data is often obtained from multiple data sources and is useful for strategic decision-making. It does not, however, contain original data. "Data warehouse," by the way, is not another name for "database." Some people incorrectly use the term "data warehouse" as if it's a generic name for a database. A data warehouse does not only consist of historic data — it can be made up of analytics and reporting data, too. Transactional data that is managed in application data stores will not reside in a data warehouse. Repository A software tool that contains data that describes other data. Here are the two kinds of metadata: business metadata and technical metadata. Data Modeling Tool A software tool that enables the design of data and databases through graphical means. This tool provides a detailed design capability that includes the design of tables, columns, relationships, rules, and business definitions. better understand the content and quality of the data. Tools ETL (extract, transfer & load) tools, as well as realtime integration tools like the ESB (enterprise service bus) software tools. These tools copy data from place to place and also scrub and clean the data. System) Software that stores data in a relational format using SQL (Structured Query Language). This is really the Database system that is going to maintain robust data and store it. It is also important to the expandability of the system. OLAP) Database software designed for data mart-type operations. This software organizes data into multiple dimensions, known as "cubes," to support analytics. Big Data Store Software that manages huge amounts of data (relational databases, for example) that other types of software cannot. This Big Data tends to be unstructured and consists of text, images, video, and audio. Query Tools Business-intelligence software tools that select data through query and present it as reports and/or graphical displays. The business or analyst will be able to explore the data-exploration sanction. These tools also help produce reports and outputs that are desired and needed to understand the data. Data Mining Tools Software tools that find patterns in stores of data or databases. These tools are useful for predictive analytics and optimization analytics. The data warehouse tech stack is built on a fundamental framework of hardware and software known as the infrastructure. Using a data warehouse appliance or a dedicated database infrastructure helps support the data warehouse. This technique tends to yield the highest performance. The data warehouse appliance is optimized to provide database services using massively parallel processing (MPP) architecture. It includes multiple tightly coupled computers with specialized functions, plus at least one array of storage devices that are accessed in parallel. Specialized functions include system controller, database access, data load, and data backup. Data warehouse appliances provide high performance. They can be up to 100x faster than the typical database server. Consider the data warehouse appliance when more than 2TB of data must be stored. Data architecture is a blueprint for the management of data in an enterprise. The data architect builds a picture of how multiple sub-domains work. Some of these subdomains are data governance, data quality, ILM (information lifecycle management), data framework, metadata and semantics, master data, and, finally, business intelligence. Data Governance (DG) The overall management of data and information includes people, processes, and technologies that improve the value obtained from data and information by treating data as an asset. It is the cornerstone of the data architecture. Management (DQM) The discipline of ensuring that data is fit for use by the enterprise. It includes obtaining requirements and rules that specify the dimensions of quality required, such as accuracy, completeness, timeliness, and allowed values. Semantics Information that describes and specifies datarelated objects. This description can include: structure and storage of data, business use of data, and processes that act on the data. "Semantics" refers to the meaning of data. data describing major subjects of interest that is shared by multiple applications. Business Intelligence The people, tools, and processes that support planning and decision making, both strategic and operational, for an organization. The diagram below displays how data flows through the data warehouse system. Data first originates from the data sources, such as inventory systems (systems stored in data warehouses and operational data stores). The data stores are formatted to expose data in the data marts that are then accessed using BI and analytics tools. Data is the raw material through which we can gain understanding. It is a critical element in data modeling, statistics, and data mining. It is the foundation of the pyramid that leads to wisdom and to informed action. Datatype The datatype, also known as the "data format," could have a value such as decimal(12,4). This is the format used to store the attribute. This specifies whether the information is a string, a number, or a date. In addition, it specifies the size of the attribute. Domain A domain, such as Currency Amounts, is a categorization of attributes by function. Initial Value An initial value such as 0.0000 is the default value that an attribute is assigned when it is first created. Rules Rules are constraints that limit the values that an attribute can contain. An example rule is "the attribute must be greater than or equal to 0.0000." Use of rules helps to improve data quality. Definition A narrative that conveys or describes the meaning of an attribute. For example, Account Balance Amount is a measure of the monetary value of a financial account, such as a bank account or an investment account." Conceptual Data Model - a high level model that describes a problem using entities, attributes, and relationships. Logical Data Model - a detailed data model that describes a solution in business terms, and that also uses entites, attributes, and relationships. 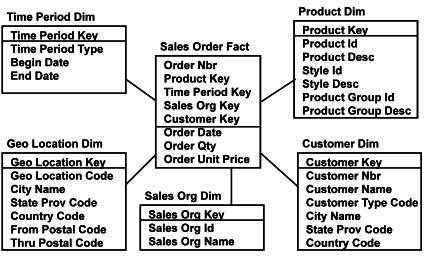 Physical Data Model - a detailed data model that defines database objects, such as tables and columns. This model is needed to implement the models in a database and produce a working solution. An entity is a core part of any conceptual and logical data model. An entity is an object of interest to an enterprise — it can be a person, organization, place, thing, activity, event, abstraction, or idea. Entities are represented as rectangles in the data model. Think of entities as singular nouns. An attribute is a characteristic of an entity. 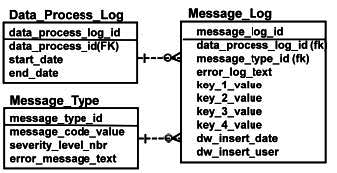 Attributes are categorized as primary keys, foreign keys, alternate keys, and non-keys, as depicted in the diagram below. A relationship is an association between entities. Such a relationship is diagrammed by drawing a line between the related entities. The following diagram depicts two entities — Customer and Order — that have a relationship specified by the verb phrase "places" in this way: Customer Places Order. 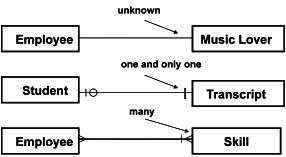 Cardinality specifies the number of entities that may participate in a given relationship, expressed as one-to-one, one-to-many, or many-to-many, as depicted in the following example. Cardinality is expressed as minimum and maximum numbers. 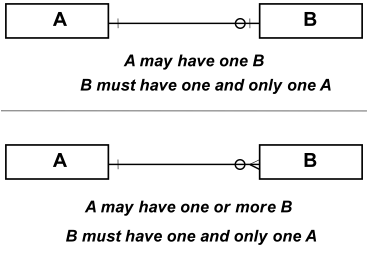 In the first example below, an instance of entity A may have one instance of entity B, and entity B must have one and only one instance of entity A. Cardinality is specified by putting symbols on the relationship line near each of the two entities that are part of the relationship. In the second case, entity A may have one or more instances of entity B, and entity B must have one and only one instance of entity A. Minimum cardinality is expressed by the symbol farther away from the entity. 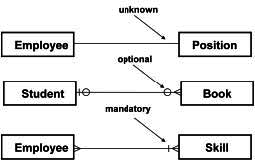 A circle indicates that an entity is optional, while a bar indicates that an entity is mandatory. At least one is required. Maximum cardinality is expressed by the symbol closest to the entity. A bar means that a maximum of one entity can participate, while a crow's foot (a three-prong connector) means that many entities may participate. This means a large unspecified number. Normalization is a data modeling technique that organizes data by breaking it down to its lowest level, i.e. its "atomic" components, to avoid duplication. This method is used to design the atomic data warehouse part of the data warehousing system. Third Normal Form The entity is in the second normal form. attributes that make up the primary key. The atomic data warehouse (ADW) is an area where data is broken down into low-level components in preparation for exporting to data marts. The ADW is designed using normalization and methods that make for speedy history loading and recording. The ADW is organized into non-changing data with logical keys and changeable data that supports tracking of changes and rapid load/insert. Use an integer as the primary surrogate key. Then, add the effective date to track changes. Track the history of relationships between entities using an associative entity with effective dates and expiration dates. Use specialized attributes to improve ADW efficiency and effectiveness. Identify these attributes using a prefix of ADW_. inserted into the data warehouse. data warehouse began to be active. dw_data_process_log_id A reference to the data process log. Code Set – Group of codes, such as "Gender Code"
A dimensional database is a database that is optimized for query and analysis and is not normalized like the atomic data warehouse. It consists of fact and dimension tables, where each fact is connected to one or more dimensions. The sales order fact includes the measurer's order quantity and currency amount. Dimensions of Calendar Date, Product, Customer, Geo Location, and Sales Organization put the sales order fact into context. This star schema supports looking at orders in a cubical way, enabling slicing and dicing by customer, time, and product. A fact is a set of measurements. It tends to contain quantitative data that gets presented to users. It often contains amounts of money and quantities of things. Facts are surrounded by dimensions that categorize the fact. Event facts record single occurrences, such as financial transactions, sales, complains, or shipments. The snapshot fact captures the status of an item at a point in time, such as a general ledger balance or inventory level. The cumulative snapshot fact adds accumulated data, such as year-todate amounts, to the snapshot fact. Aggregated facts provide summary information, such as general ledger totals during a period of time, or complaints per product per store per month. The fact-less fact tracks an association between dimensions rather than quantitative metrics. Examples include miles, event attendance, and sales promotions. A dimension is a database table that contains properties that identify and categorize. The attributes serve as labels for reports and as data points for summarization. In the dimensional model, dimensions surround and qualify facts. Date dimensions support trend analysis. Date dimensions include the date and its associated week, month, quarter, and year. 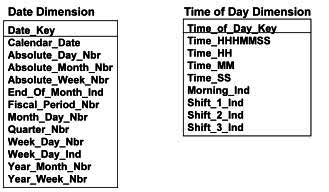 Time-of-day dimensions are used to analyze daily business volume. One dimension can play multiple roles. The date dimension could play roles of a snapshot date, a project start date, and a project end date. A degenerate dimension has a dimension key without a dimension table. Examples include transaction numbers, shipment numbers, and order numbers. SCD Type 0 Data is non-changing. It is inserted once and never changed. dw_insert_date The date and time when a row was inserted into the data warehouse. dw_effective_date The date and time when a row in the data warehouse began to be active. dw_expire_date The date and time when a row in the data warehouse stopped being active. Data integration is a technique for moving data or otherwise making data available across data stores. The data integration process can include extraction, movement, validation, cleansing, transformation, standardization, and loading. In the ETL pattern of data integration, data is extracted from the data source and then transformed while in flight to a staging database. Data is then loaded into the data warehouse. ETL is strong for batch processing of bulk data. In the ELT pattern of data integration, data is extracted from the data source and loaded to staging without transformation. After that, data is transformed within staging and then loaded to the data warehouse. The CDC pattern of data integration is strong in event processing. Database logs that contain a record of database changes are replicated near real time at staging. This information is then transformed and loaded to the data warehouse. CDC is a great technique for supporting real-time data warehouses. Thanks to the agility offered by today’s cloud-based data warehouse solutions, there are cutting-edge innovations that can automate some of the key aspects of data warehousing. For example, the ETL process described earlier has changed considerably thanks to machine learning and natural language processing, ultimately resulting in its complete automation. What’s more, data warehouse storage and compute have also benefited from automated optimization, saving data analysts time on tasks associated with querying, storage, and scalability, which dramatically cuts down costs, coding time, and resources. Seamlessly connect to third-party SaaS APIs. Easily connect to the most common storage services. 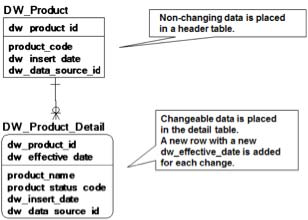 Data types are automatically discovered, and a schema is generated based on the initial data structure. 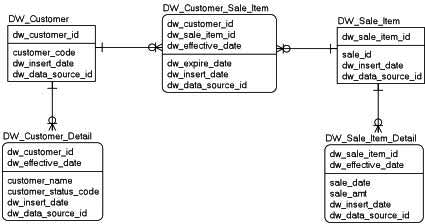 Likely relationships between tables are automatically detected and used to model a relational schema. Table history feature allows you store data uploaded from API data sources, so you can compare and analyze data from different time periods. Re-indexing happens automatically whenever the algorithm detects changes in query patterns. Redistributing the data across nodes to improve data locality and join performance is done automatically. To remedy concurrency issues, new cloud data warehousing technologies today can separate storage from compute and increase the compute nodes based on the amount of connections. Consequently, the number of available clusters scales with the number of users and the intensity of the workload, supporting hundreds of parallel queries that are load-balanced between clusters. Data warehouse automation has also vastly improved how data is stored and used. New, “smart” data warehouse technologies constantly run periodic processes to mark data and optimize the storage based on usage. Smart data warehouse technology scales up and down based on the data volume. Scaling happens automatically behind the scenes, keeping clusters available for both reads and write, and thus ingestion can continue uninterrupted. When the scaling is complete, the old and new clusters are swapped instantly. In addition, the data warehouse maintenance itself has been greatly improved, as well, by automating the cleaning and compressing of tables to boost database performance.